Posted: Thursday 7th January 2016 in Events and Awards. 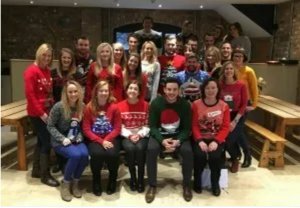 Christmas is a busy time of year here at Summit – not only are we gearing up for the busiest time of the retail calendar, there’s also lots of festive fun to be had! We started our Christmas celebrations with a visit from Santa; but he wasn’t here to see us, he came to meet our mini Summiteers and help them decorate our Christmas tree! The following week our Albion Mills office was transformed into Gatsby’s house for an amazing 1920s themed Christmas party. After a champagne reception and a performance by a sensational Las Vegas illusionist, we dined in style with a fantastic festive banquet, then danced the night away to live music from a fab local swing band. With Christmas creeping ever closer, last week we donned our cheesy novelty jumpers, exchanged funny gifts in the ever hilarious tradition of Secret Santa, and tucked into a traditional Christmas dinner as one big happy family. All in all it’s been a fabulously fun festive period at Summit, and we’re now looking forward to the New Year and all of the amazing possibilities it holds for both business and pleasure! Merry Christmas & Happy New Year from everyone at Summit!